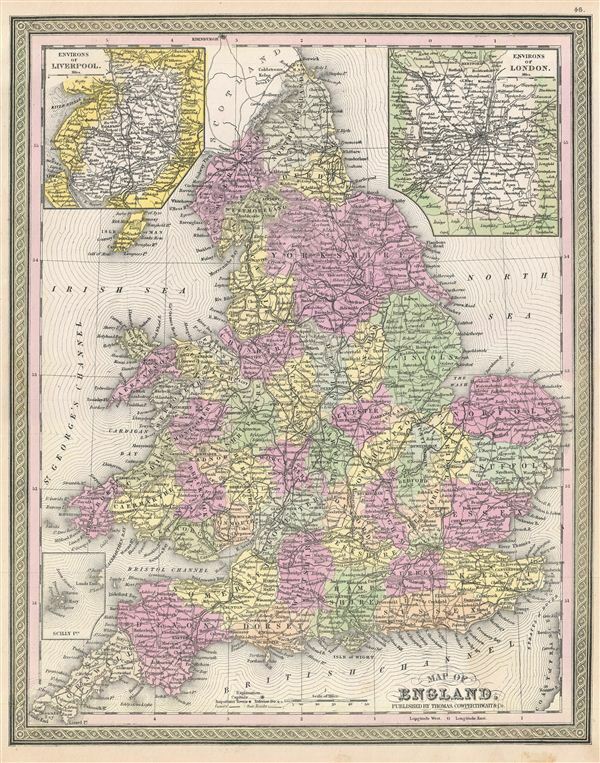 A fine example of Thomas Cowperthwait and S. A. Mitchell's 1854 map of England. Covers all of England from Northumberland in the north to Cornwall in the south. Two insets in the upper left and right quadrants depict the environs of Liverpool and London, respectively. A small inset of the Scilly Islands is featured in the lower left quadrant. The whole is engraved in Mitchell's distinctive style with green border work and vivid pastels. Political and topographical features are noted and color coded with elevation rendered by hachure. Rumsey 0537.045 (1846 edition). Phillips (Atlases) 814.